As a member or a visitor to this site, you may have questions. We try to cover everything you might ask here so you can get your information quickly. If by chance you have a question that is not listed below please email the webmaster or one of the committee members and they will be glad to assist you. Your question may even be posted here to help others that may also have the same question. There is no such thing as a dumb question. Ask away! 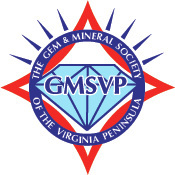 Do I have to have a large rock collection to join the GMSVP? No, In fact many members join the club with no collection at all. You only need an interest in geology. Will I feel embarrassed if I don't know much about rocks and minerals? Not at all. We have members with all levels of experience and education. Of course. Well behaved children are always welcome. We even have a special program called "Pebble Pups" just for kids. Is it expensive to belong to the club? Hardly. We think it is the best deal in town. Dues are $20 per year (January to January) for couples, $15 for individual adult and $25 for family. Dues are to be paid by Dec10th for the next year, so we can provide a count for insurance coverage for members on field trips. Most field trips are free except for transportation. A Geode is a rock formation combining minerals to produce hollowed-out rock that have crystal linings on the inside. Sometimes the Geode just contains layers of minerals and is solid inside. It could take a long time to form a Geode. The crystal Geodes start their lives as a hollow bubble inside a layer of rock. The bubble could be from air inside explosive volcanic rock or it could come from the hollow remains of animal burrows or tree roots. There are several pictures of a what a Geode looks like on the GMSVP website.